Liuhe ( means Six Harmonies ) Pagoda lies in Yuelun Hill on the north bank of the Qiantang River in Hangzhou, Zhejiang Province. The name "six harmonies" comes from the six Buddhist ordinances, meaning "harmonies of the heaven, earth, north, south, east, and west". 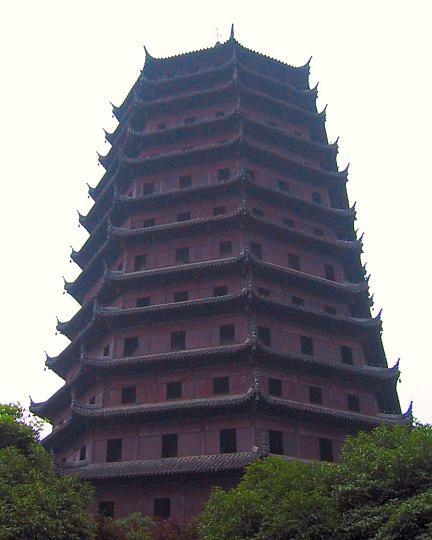 This famous octagonal pagoda was first built in 970 AD by the King of Wuyue State, who intended to demonstrate his authority by conquering the evil of the river tidal bore of the Qiantang River. The 60 meter (197ft) brick and wood structure is considered a masterpiece of traditional Chinese architecture. The pagoda fell into ruins and went through reconstruction many times before being listed as one of the key national cultural heritages in 1961.